Picture this: you’re a busy, busy mom always running after your little one(s). Most likely, some days are great, and others…well, not-so great. But, you would never trade it for the world! Being a mother is a beautiful thing—a messy, sticky, stressful, guilt-ridden, fun, amazing thing. However, that doesn’t mean you shouldn’t find something else you love to do simultaneously! For me, that “thing” was yoga. And it has changed my life, the way I raise my kids, and the dynamic in my household. 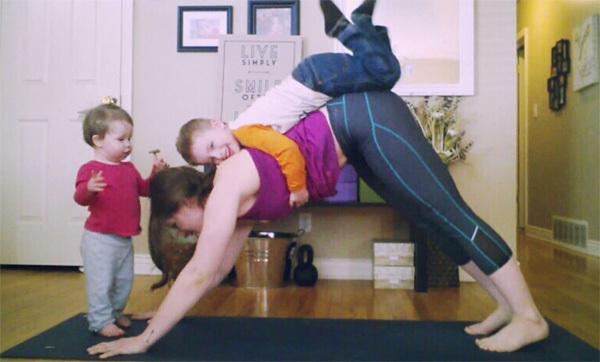 If those reasons aren’t enough, I want to share with you some more reasons to practice yoga as a mommy! 1. Improve your body image. Yoga teaches us to live a life of non-judgment towards ourselves and others. We learn this in our asana, our poses on the mat. When we feel really great in a certain pose one day, but can’t quite seem to get into that pose on another day, it reminds us that we are human and flawed, yes, but that we are perfectly imperfect. We are right just the way we are, and we are beautiful. It is no joke just how much motherhood demands of a woman’s body. You literally give your body away for 10 months in order to grow a tiny human, and no one really warns you that these demands on your body do not disappear by simply giving birth. You are giving up your body for a long time when you sign up to become a mommy. Having yoga in your life gives you a space and time to own your body. You are strong and graceful, and your yoga practice will remind you of this. Let’s admit it, fellow mommies—it is nice to have this reminder! When you challenge yourself to breathe through it and stay there, you are reminding yourself that nothing is permanent. It seems silly to relate something as simple as holding a yoga pose to the daily tests our kids can put on our patience, but every little thing counts when you’re a mom. The little self-reminder of saying, “nothing is permanent”—as your kids pull out the crayons and start coloring all over the couch—may just be what you need to keep you from locking yourself away in a room somewhere! Yoga is a great tool that will bring a beautiful self-loving and accepting energy into your life. Along with the peace and calm we all search for, your asana practice will also test your physical strength. We all know how important endorphins are for your mind and body. They help bring a slightly different type of confidence boost and glow. It is so great to focus on the amazing mental and emotional benefits that your practice can bring (i.e. self-love and acceptance), but don’t let it de-value how your physical asana practice can actually help you fuel your positive body image! 5. Teach your little ones invaluable lessons. Some of my truly fun and happy moments are when my 4-year-old boy rolls out a yoga mat and “practices” yoga next to me, or when my 1-year-old girl will hop on my mat and get into a Down Dog position. You’ll realize that you actually don’t need to technically teach your little ones anything for them to realize how fun yoga is. It will melt your heart when they want to join in, because you’ll know that one day, they will know the power that yoga has! To teach your child yoga is to teach them all of the above: patience, a healthy body image, physical fitness, and the how to own yourself. How amazing would it be for our generation of little ones to know and practice these things as they grow up? It could maybe even change the world! So what are you waiting for, mama? Go roll out that mat!